February | 2014 | Twist Comics – The english blog! 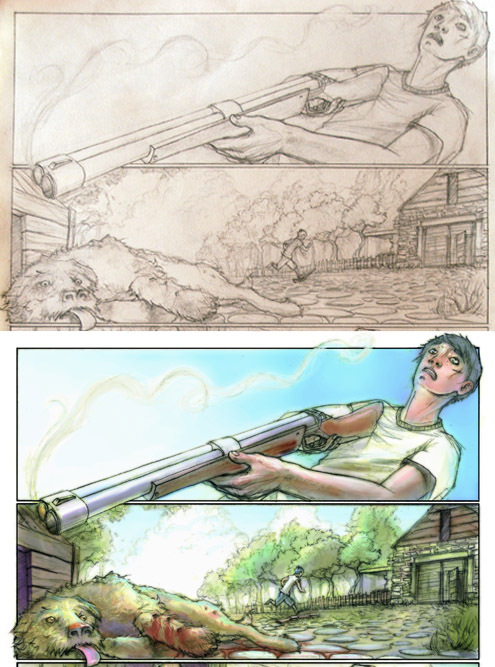 From a visual perspective which strengths and weaknesses do you find in the comic “There’s no accidental shooting”? I think one of the best compliments I can say to Andres R.´s “There’s no accidental shooting” is that reads very fluently. I love that being the first comic from Andrés, he got away with it on all shapes and angles in his pictures. He makes equally interesting an extreme close-up or a full shot. At first, I was sort of against the main character having blue hair and I told him that Andrés a couple of times, but he was completely sure about that decision, then I said to myself that I didn’t remember any lead character being freckly and blue haired, so at least we would havet a main character very recognizable. And as time goes on, the more I see it the more I think Andrés was right on keeping him with that peculiar hair color. The only bit I would have changed is that I´d had preferred a statue of justice “more classic-looking” with the scale and the blindfold so it would be more obvious. What about the script? Will you change anything? I have to say that I rewrite dialogs on the 90% of all my short comics when I see the final pages, but with “There’s no accidental shooting” I did not do it. So many people have told me that with this subject matter I could have write a longer story but one of the things I like most is how short and concise turned out. Maybe a weakness in my writing is how evil is the general but sadly there is people like that. And the world sometimes it is black and white. 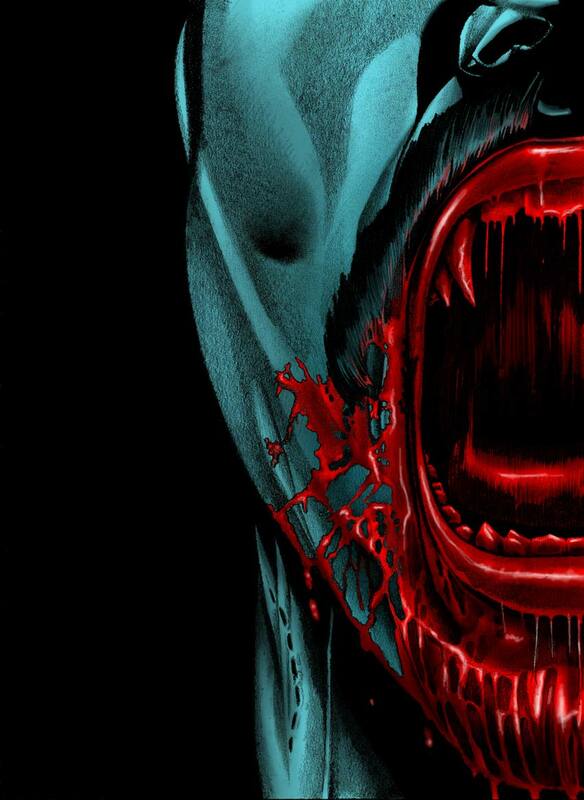 JUAN FIORAMONTI DOES NOT DRAW BRING AND EMO VAMPIRES. DISCOVER IT IN “COLMILLOS”. 1. – How and when did you start reading comic books? I can’t recall at what age, but I remember reading “El Jueves” magazines that my father used to buy and “Totem” magazines that my uncle kept on his shelf. I also remember some “Mort and Phil” volumes we had back home and seeing some “Tintin”books in the bookcase. I say seeing because I used to look at the pictures, not to read them. Anyway, I was never much of a reader. One of the few comic books that I used to follow is “SPAWN”. I was hooked on that one for a while. 2. – When did you decide you wanted to be an illustrator? I have never decided it. I was good at drawing (I guess), but I wanted to be a paleontologist. I ended up in arts because it seemed easier and funnier than science. Now I want to be a biologist. 3. – Tell us about your training process and your major influences. 4. – What do you like most about your work as an illustrator? What is it that you like the least about it? What I like the most is getting payed, and what I hate about it is working too much without getting paid. Besides that, the most rewarding thing is to start a new piece of work knowing where you have to add or remove colour. The worst thing is that the more you go on with that piece of work the more information you have, and it gets more and more difficult to make the right decisions when creating the light or shapes you want. I don’t want to get too philosophical about it. 5. – Why did you decide to join this webcomics project? To keep on drawing, to experiment and to improve. It’s also a good excuse to thicken my portfolio and to improve my artistic résumé. 6. – What appealed to you about the history you drew? Nothing in particular… I don’t know… I find curious the ellipsis of the history and the timeless coincidences. Another advantage is that this story shows how certain important events can be manipulated and justified to create deep changes in society, regardless the life and freedom of individuals. 7. – Could you explain us a little bit your decisions when designing the main character of your story? I’ve created a dark-haired clear-eyed character because it is more appealing than a clear-eyed blonde. Apart from that, it had to have some special features, so that our main character could be recognizable in each vignette. That’s why I drew him a scar on his left cheek and freckles, tips that the writer had suggested me. 8. – Why did you use blue for the main character’s hair? (I couldn’t help asking you that). Maybe because of the manga reminiscence of my youth, and because blue is cool. 9. – How much time did you spend on average per page and what was your process when drawing and communicating with the writer? I spent 5 days sketching, with intensive 10 hours sessions each day (more or less) helped by beer (or unhelped) and many cigarettes. Before scanning the pages in pencil, I accomplished the painting process using photoshop. It took me about 5 to 6 hours to paint each page. Overall, about 15 hours or so per page. Note that the writer is an alien and I belong to another dimensional plane so, and despite our differences, we managed to have a pretty optimal communication. 10.- Which comic strip pleases you the most? Explain it and if there are any spoilers we will let our readers know about them. I think the second strip on page two is one of the most spectacular. Although, in my opinion, it can always get better. 10b. – Which cause is worth fighting for? Everything that is good for you, for everybody and for the people around us. 11. – What are your next projects and what are you working on right now? I run my own business. I design T-shirts with original decorations. I teach photoshop and drawing at an affordable price and I also run a blinds painting and interior decorations for stores company. I’m also working on a new comic, a science fiction project called “First Hunt” written, again, by Fernando Verniere. 12. – What is the work / illustration you feel most proud of? None of them, they all can be improved … although I am painting on computer a fantastic turtle which is turning out very nice. 13.-When you were in class, who did you learn more from, your teachers or your classmates? I learnt from all of them. I was lucky, I had good teachers, (except for my English teacher in secondary school) and strange, as well as creative, classmates. I enjoyed and learnt a lot from them. In addition, even though some teachers did not teach me their subject very well, they taught me other aspects of the human condition. I love them all, (except for the English teacher, I don’t like her). 14.-Back on the likings and hobbies. Which comic book series you follow regularly? 15.-If you knew that tomorrow an apocalypse would start, what would you do today? I would play the ocarina of “Zelda” to go back in time and avoid it. That I can leave whenever I want. 17. – What is the best advice you can give? Say no, even if that means you won’t make a good impression. 18. – If you could erase one thing in the world what would it be? Complicated questions and simple answers. 19. – What good things do you expect to happen in the next few months? An alien invasion, running out of oil and free phone calls. 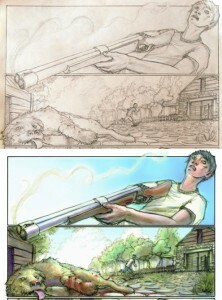 PENCILS AND FINAL ART: ANDRES R.
1 – How did emerge the idea for the script “I won’t surrender”? The germ of the idea came from an illustration of a cartoonist named Albert Ausias Bartorell, which shows a group of tiny bugs walking on a completely white space where the only reference ground where they are walking is the projection of their own shadows. Seeing it, gave me a kind of existential “horror”, since these bugs moved through a seemingly infinite space where there is no spatial reference and probably they would never get anywhere because it was a whiteness without end. From there, my imagination flew and made me think about writing a short story where I could play with space conventions, the limits of the comic page. That approach changed somehow when Bruno Garcia Valencia decided to draw this story, we moved away a bit from making the whole world to be a “white” space and humanize the main character. Now we certainly have a greater sense of progression and advancement in this trip that our lead character takes, as there are different kinds of spaces until she arrives to the “white space” . Once there, to escape this existencial trap, the lead character can only have one actitude. 1 – How did you start reading comic books? When I was in primary school, I remember they had the Asterix comics at the library. I guess that’s when my hobby started. 2 – When did you decide you wanted to be an illustrator? Since I was a kid I knew I wanted to be an illustrator, but it was not until I turned 18 that I started to put all my effort into it. 3 – Tell us about your academic training and your major influences. I am still educating myself, I always try to. I think it’s a process that will never end. I think it is essential to have new concerns and to try to improve every day. I have a lot of artistic influences, from impressionistic painters like Claude Monet or Giovanni Boldini, from current renowned artists like Miguelanxo Prado, from others not so well known and from Tom Waits’ music, among others. 4 – What do you like most about your work as an illustrator? What is it that you like the least about it? What I like the most is to experiment with colors and to draw strangers without them knowing that I’m drawing them. What I least like is knowing that tomorrow I will dislike what I draw yesterday. 5 – Why did you decide to join this webcomics project? With this project I had the chance to start again with the comic strips. Comic books are a good way to express myself artistically and in this webcomic there are a lot of great artists. I guess that’s what made me take the decision. 6 – What appealed to you about the story you drew? What attracted me the most was the main character. She’s very brave, a fighter, but with a lot of insecurities. 7 – Could you explain us a little bit your decisions when designing the main character of your story? She didn’t have to be a human being, but we should be able to sympathize with her. I managed that by giving her features and facial expressions similar to ours. Besides, I had to design a leader, striking but not overloaded. At the same time, she shouldn’t be conceited nor arrogant. 8 – How do you achieve those amazing colors in your illustrations? Have you got any philosophy or way of searching colors? No, I just attempt to like my own colors. To me, the color is a very important element in an illustration and I try to indulge that part. 9 – How much time did you spend on average per page and how was your process when drawing? I could tell you in days, maybe about 3 or 4 days per page, without counting the previous days, when I plan the comic strip. 10 – Which comic strip pleases you the most? Explain it and if there are any spoilers we will inform about them. The page that I like the most is the fourth one, I don’t want to explain too much. I like the serenity it tries to transmit. 11 – When was the last time you went against the grain, like the main character in the story? Sometimes you have to go against the grain when it comes to illustration, especially at the beginning. It seems like it’s not a job everybody is willing to accept. 12 – What are your next projects and what are you working on right now? Right now I’m preparing an exhibition for the Enokojima Art, Culture And Creative Center in Osaka. 13 – What is the work / illustration you feel most proud of? 14 – Back on the likings and hobbies subject: which series or tomes do you regularly follow? Right now I don’t follow any comic books, not much at least. I am rediscovering Bill Murray’s films, an actor who I love and lately I enjoy watching his movies. 15 – If you knew that tomorrow an apocalypse would start, what would you do today? Sleep all day. No, seriously, I would break dance naked at the front door of a convent and at the last minute I would fight a Bengal tiger. 16 – If somebody would receive you at the heaven’s or hell’s gates, what would you like him to tell you? I would like him to offer me a good Belgian beer. 17 – What is the best advice you can give? The best advice you can give it yourself, by accepting things the way they are and not as you want them to be. 18 – If you could erase one thing in the world, what would that be? Political corruption. Only by eradicating this problem, we would solve a lot more. 19 – What good things do you expect to happen in the next few months? I thank you in advance to all of you that visit the Twist Comics Website to read our stories, without you nothing makes sense. I also want to thank the work and trust that over 30 artists that collaborate in Twist Comics have given us. And specially to Juan Fioramonti, because from the moment we started working together, I realized that this project was possible. Also, I have to thank Rocio Parra another ofour astist who is also doing an excellent job as Press officer of the “southern delegation” of Twist Comics. Also, this will be the place where sneak peaks of future comics in development will be shown, together with news and contests. 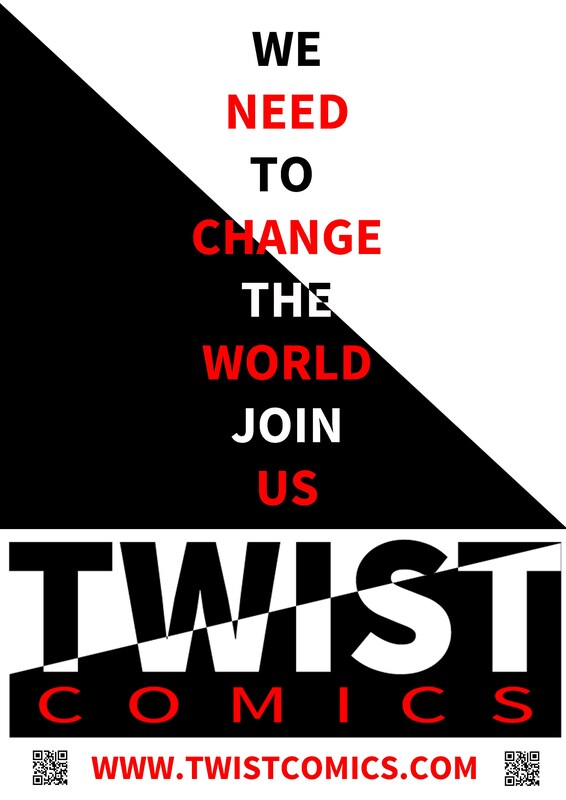 Stay tuned because the Twist Revolution has begun and I’m sure you won´t want to miss it. 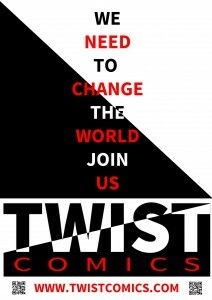 THE TWIST REVOLUTION HAS BEGUN! !